Many years ago, when I was a fresh-faced youngster, I stumbled into the Rowden White @ Melb Uni and discovered a treasure chest beyond my wildest dreams. They had a whole wall devoted to comics: all the Alan Moore’s, all the Frank Miller’s, all the Neil Gaiman’s, all the Cerebus stuff, every Neon Genesis spin-off imaginable. For about six months I was like a kid in a candy store, gorging myself mindlessly on everything that fell to hand. One of the best things I read during that period was The Watchmen. It’s often said that pundits that it was the first graphic novel. It shattered previous notions of what a comic could do and changed the way people perceived the medium. Hence it’s position on Time magazine’s list of 100 best ‘novels’ of the 20th century in 2005. Like a lot of people, I was keen to see what Hollywood would do with it. I secretly hoped The Watchmen film might do, for superhero films, what it had done for superhero comics. It’s not that The Watchmen is a bad a movie…compared with some of the dross that emerges from Hollywood’s gaping maw, it’s actually quite good. But compared with the original work, it’s dismal. The brilliant thing about The Watchmen comic was that it took the medium to its highest expression. As with other great works in other mediums (Ulysses in novels, Waiting for Godot in theatre, Apocalypse Now in film) that meant discovering something unique and inimitable – and not just in terms of content but form. I was quite bemused when I found out, not long before The Watchmen movie came out, that Alan Moore (the writer) had requested his name be removed from all associated material. Not only that, he refused to have any involvement with the movie whatsoever. I find film in its modern form to be quite bullying. It spoon-feeds us, which has the effect of watering down our collective cultural imagination. There are three or four companies now that exist for the sole purpose of creating not comics, but storyboards for films. It may be true that the only reason the comic book industry now exists is for this purpose, to create characters for movies, board games and other types of merchandise. When I read this I thought, “Oh what an old crank.” But now, having seen the movie, and re-read the comic, I can see what he means. 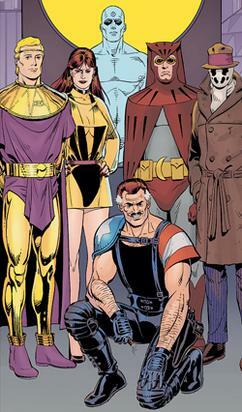 One of many advanced techniques used in The Watchmen was contrapuntal frame-by-frame storytelling. Moore cross-blends multiple voices and stories and gradually allows them to bleed into each other. It’s not the sort of thing you could do in a movie unless you broke the screen into multiple sections (and even then it wouldn’t work very well). But in The Watchmen film this William Burroughs cut-up narrative effect is entirely absent. And there is none of the richness of symbolism that Moore drew from William Blake. In theory, comic and film are closer than other mediums. Both combine of text and image in order to tell a (usually) linear narrative. Comics should therefore translate better into film than novels (too interior) or plays (too verbal). Which is, in most cases, true. But not for The Watchmen. The lesson to be learnt is that narrative is not free-floating. It exists suspended within form, or medium. And each artistic medium does different things well. Which is why our desire to constantly translate books and comics for film is misguided. We should be sifting through piles of screenplays for the next true original. And leaving masterpieces like The Watchmen and The Road to do their own thing. The only good thing to come out of the whole escapade is the animated Tales of the Black Freighter. Captain's B'log · White Whale Theatre is an independent Melbourne company captained by a passionate core of young thespian Ahabs.